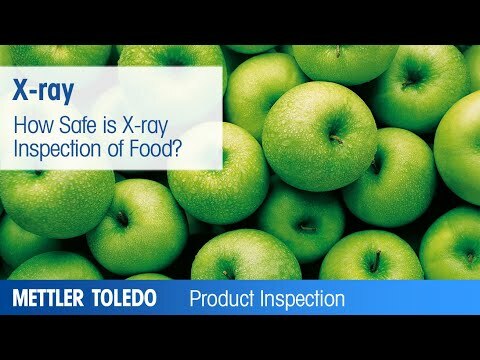 Why X-ray Inspection of Food is the Right Choice! X-ray technology is the ideal solution to inspect food, identifying physical contaminants such as metal, glass, calcified bone, stone and dense plastic to guarantee product safety. Simultaneously x-ray systems can also measure mass, count components, identify missing or broken products, monitor fill levels, inspect seal integrity and check for damaged products or packaging, ensuring product integrity. X-rays are very safe. Radiation levels used by x-ray inspection systems for food are exceptionally low, while x-ray inspection equipment operates work within very high safety limits. A study by the World Health Organisation (WHO) confirmed that radiation levels up to 10,000Sv (10,000.000µSv) do not affect food safety or nutritional value. far less than the amount absorbed from naturally occurring background radiation. Natural background radiation contributes to 2,400µSv of radiation in a year from natural sources, whilst occupational exposure, immediately adjacent to an x-ray system, is less that 1µSv an hour. You don’t need to be an x-ray expert to understand why x-ray inspection of food is safe for everyone. A brand new Infographic in poster format explains you all the facts in a fun and easy to understand way. Metal Detection, X-ray Inspection or Both? Understand the capabilities and limitations of x-ray and metal detection technologies in this informative white pape. Download the expert white paper 'Improving Food Safety Inspection of Bulk Products'. Find out how X-ray Systems and Metal Detectors can ensure Food Safety of Pumped Foods. Free X-ray Inspection Guide, this guide covers the entire range of x-ray inspection issues.